Welcome to my blog. This won’t be your standard “I’m going to blog every single day because I’m so excited about blogging” premiere blog post (followed, inevitably, by one week of daily posts and then a sharp demise into rarely ever posting). It’s too much pressure and frankly I don’t have any readers yet so why make any promises? Although my skills are a little rusty, I’ve been blogging on and off since 1998. That’s an eternity on the internet! As a blogger, I’m the equivalent of the old lady sitting in a rocker on her front porch. I blogged back when uploading images was a Kafka-esque nightmare of ftp servers and permission errors. I blogged when blogging was the only way to tell people what you thought because we didn’t have Facebook or Twitter. No son. No Facebook at all. Sorry, where was I? Oh yes. Despite my elderly blogging stature I’m actually, so I tell myself, still young. I’m in my 30s, and I decided to start this particular blog to talk about my passion for collecting antiques and vintage items. It’s a somewhat unusual passion for someone my age. People of my generation are supposed to go to Ikea and get a pine table with matching chairs, a particle wood bedroom set, and maybe a plate of those cheap but disturbingly tasty meatballs. It’s modern. It’s clean. It’s kind of boring. Well, in all honesty I do have lots of modern furniture in my home and for certain uses new is simply better. It’s not about being a zealot, but about mixing the new with one of a kind antiques, funky vintage stuff, and the occasional piece of original art. I called my blog “The New Collector” because I am part of the new generation of antique collectors. I want to spread the word to others who might not see the value in “used furniture”, or who might want to try buying antiques but aren’t sure where to start. I want to show you that antiques can be fun, vintage can give your space personality, and spending your money on really interesting items that will actually appreciate in value is awesome! 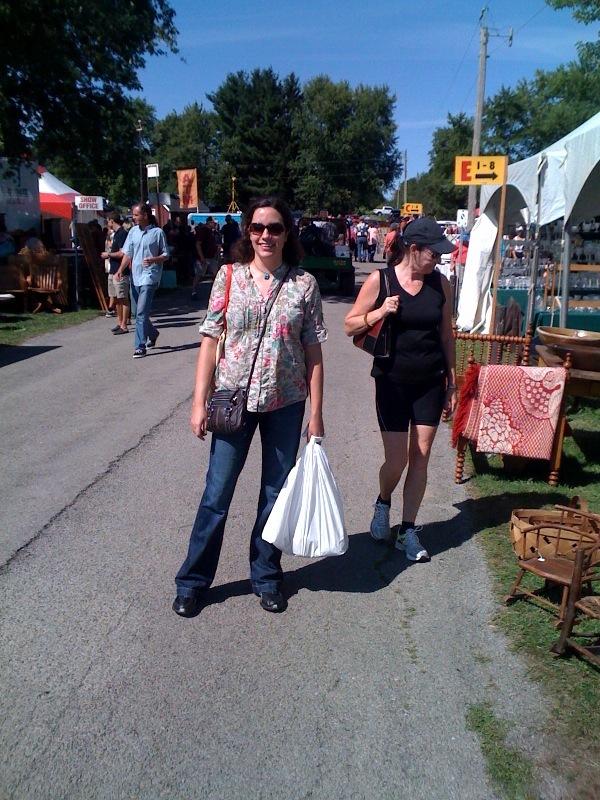 Me at the Christie Antique Show. No idea who that woman is beside me. Let’s assume another antiques enthusiast! It is my hope that this blog will grow to encompass many aspects of antique collecting including how to buy, where to look, cleaning & refinishing techniques, the environmental benefits, and why antiques are a great financial investment. 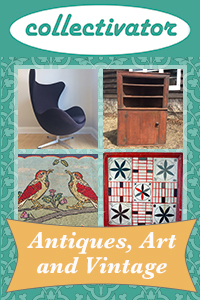 I would also love to highlight other young collectors, blogs and antiques related TV shows. I might even start making little videos and doing interviews. I’ve got big dreams for my blog and I am excited to get started. Thanks for stopping by and I hope you’ll visit again soon! I really would like the two McCoy yellow flower pots. Do you sell or just show and tell? I appreciate your interest but I just show and tell. Sorry! Good luck finding McCoy (they are still out there at shows, markets and online) and thanks for visiting! Its nice to hear from you that at young age you are into antique collection.me too antiwue collector of coins, heirlooms, furniture,utencils and other stuff.